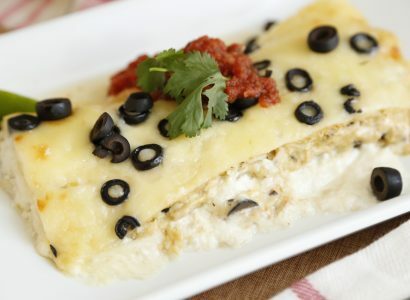 These decadent gourmet enchiladas have a cream base. Hearty and oven baked, they are sure to be a family favorite or perfect for any potluck. Melt butter in a frying pan over medium heat. Add onions and cook until they start to brown (20 mins). Remove from heat and add chicken, pimentos and cream cheese. Lightly mix until blended. Season to taste with S&P. Set aside. Heat oil in small frying pan. Dip each tortilla into oil for a few seconds just before it begins to blister. Do not fry crispy. Drain, tap excess oil with paper towel. Spoon 1/3 cup of the chicken filling down the center of tortilla, roll to close. Place all in 9 x 13 baking dish. Whip whipping cream, place Whipped cream on top of enchiladas, sprinkle evenly with Monterey Jack cheese. Bake, uncovered in a 375 degree oven for 20 min. or until heated throughout. Serve with EVK Salsa on top.